Those are the words of Moja Tu’s first university student, Jackson, after we checked in on him to see how his first university term was going. We were so happy to find that the smile that came from the imagination of college is still there as Jackson enjoys the reality of college studies. 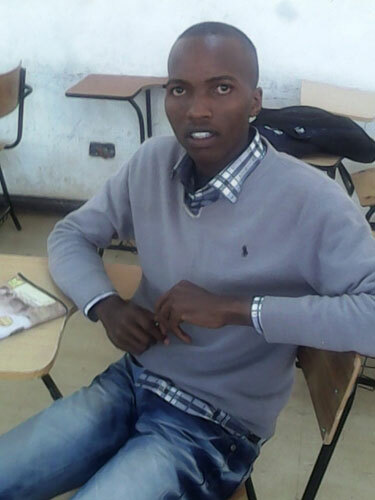 Jackson joined The Multimedia University of Kenya this January and has experienced some of the same challenges that all university students do…like not being able to get the classes you want to take! However, through his determination, he was able to get enrolled in the classes in print media and public speaking that he had targeted. Additionally, Jackson is attending three linguistic classes that he is “really enjoying”, plus classes on HIV/AIDS and Computer Applications, which are required for all first year students. Above all though, Jackson understands how important this opportunity is for him and realized that while some might have had better grades than he did in Secondary School, this is a fresh start and he is determined to get the best grades in University. “I have realized I need to work very hard and practice much especially with my friends to make these skills look natural in me. Some of the fresher’s have near perfect command of the English language and I have to master the same”. But what makes Jackson even more special is that he understands that he is a role model to all of the children at Tania Centre. To these children he leads by example, by going to school early and studying hard, but also by relaying stories of college to the children so that maybe they can have the same dreams he did when he was their age. We are so proud and excited to see this great young man accept the challenge this opportunity has provided. We are, however, even more proud and excited to see this great young man turn into a great man as he continues his college journey. Keep up the good work Jackson, the entire Moja Tu family is behind you!